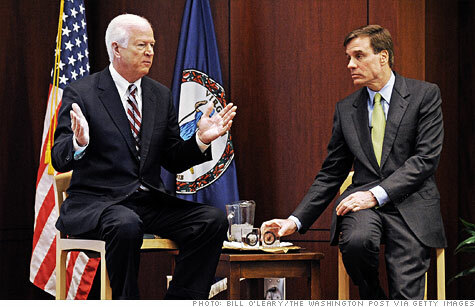 Leading by example: Republican Senator Saxby Chambliss and Democrat Mark Warner came together for public meetings on national debt in each of their home states. Robert L. Bixby is the executive director of the Concord Coalition, a nonpartisan, grassroots organization that supports fiscal responsibility. He can be reached at bixby@concordcoalition.org. Well, the super committee gave up. But Congress and President Obama cannot. With the United States moving rapidly toward a dangerous level of national debt, our elected officials must act to end the unsustainable path we're on. In moving forward, they should heed two important lessons from their failures in 2011: Focus on the issues that matter most, and don't exclude the public from the discussion. If the events of 2011 have taught us anything, it is that backroom negotiations over limited goals are not how our nation's fiscal challenges will be solved. Washington made some progress this year with the enactment of caps on annual appropriations for domestic and defense spending. But those programs are not the main source of future deficits. Congress needs to look beyond the next decade. Medicare, Medicaid and Social Security are all growing faster than the economy and faster than projected revenues, even if the Bush tax cuts expire. So any credible long-term plan must include cost-saving reforms of these programs. At the same time, there is ample room to reform the tax code by cutting back on the roughly $1 trillion a year of tax deductions, credits and exclusions (i.e. loopholes), lowering rates and actually bringing in more revenues. Addressing the fiscal gap will involve politically difficult choices to restrain the growth of popular programs or raise more money to pay for them. And to do that, the discussion must be broadened beyond meeting rooms on Capitol Hill closed to the public. The issues at stake have profound consequences for our nation's future, and compromise will be necessary. That means the American people must be included. To gain some useful perspective, it helps to ask: What would happen if Congress did nothing? Looking strictly at the numbers, the results would be pretty good. Under current law, $1.2 trillion in spending cuts triggered by the super committee's failure would take effect and $4.7 trillion in tax cuts would expire, raising government revenue by significant amounts and lowering future interest costs. According to the Congressional Budget Office, this would bring the budget into "primary balance" -- meaning that revenues would cover all spending except for interest payments -- by 2014. The national debt would come down somewhat from 67% to 61% of the economy. More would need to be done, but that's not a bad start. There are problems with sticking to the exact policies and timing of current law, including legitimate short-term economic concerns. Nor should the brunt of any deficit reduction plan be placed on those who can least afford it. To accommodate those circumstances, Congress could make some changes in the mix and timing of policies but still aim to keep the 10-year deficit-reduction total from current law on track. Government projections assume the $1.2 trillion in savings Congress intended to back up the super committee, and financial markets are counting on them. Repealing the trigger or reducing its impact would further erode congressional credibility and possibly lead to another downgrade of the nation's credit rating. There is still time for Washington to get things right before expensive, deficit-financed policies are extended. A commitment to a process that enforces strict pay-as-you-go rules and guides policies toward the deficit reduction in current law would help. The Concord Coalition's deficit-reduction exercises and other public engagement efforts in cities across the country have consistently shown that people of all ages and varied ideologies are willing to make hard budget choices -- as long as there is shared sacrifice, with everything on the table. Members of Congress with differing viewpoints should pair up for "two-by-two" fiscal forums in which they present agreed-upon facts and engage with each other's constituents about budget options. Such forums would broaden understanding of the key issues and promote civic discourse about solutions. A good example was set earlier this year by Senators Mark Warner, a Democrat from Virginia, and Saxby Chambliss, a Republican from Georgia. The two held joint forums in Richmond and Atlanta. Back in Washington, members should also pair up in co-sponsoring bipartisan plans to address the deficit, with or without the support of congressional leaders. Efforts such as the Senate's "Gang of Six" should be revived and expanded. The logical place to start is with the recommendations of the Bowles-Simpson and Rivlin-Domenici commissions. Congress still has much work to do, and public support will be required for the difficult reforms that are necessary to put the country on a more responsible path in the years ahead.